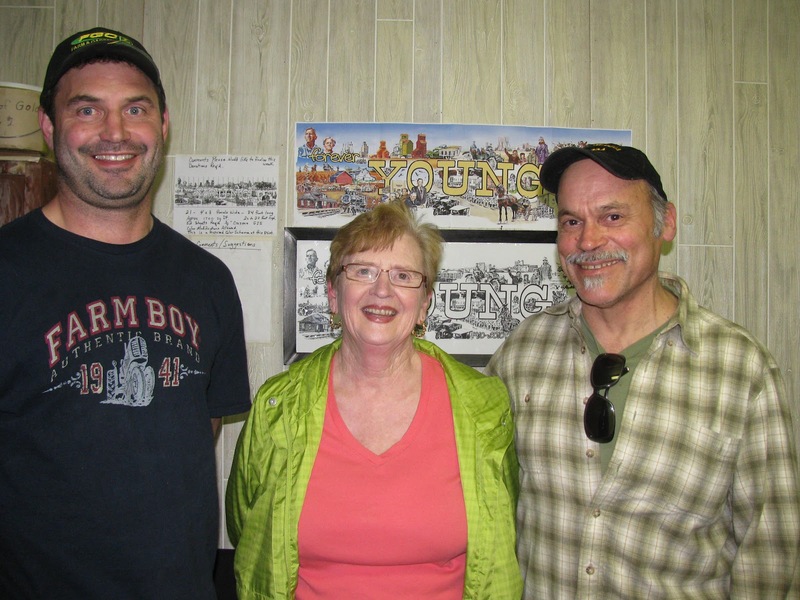 Last night's meeting with the Young Centennial Planning Committee was a big success. 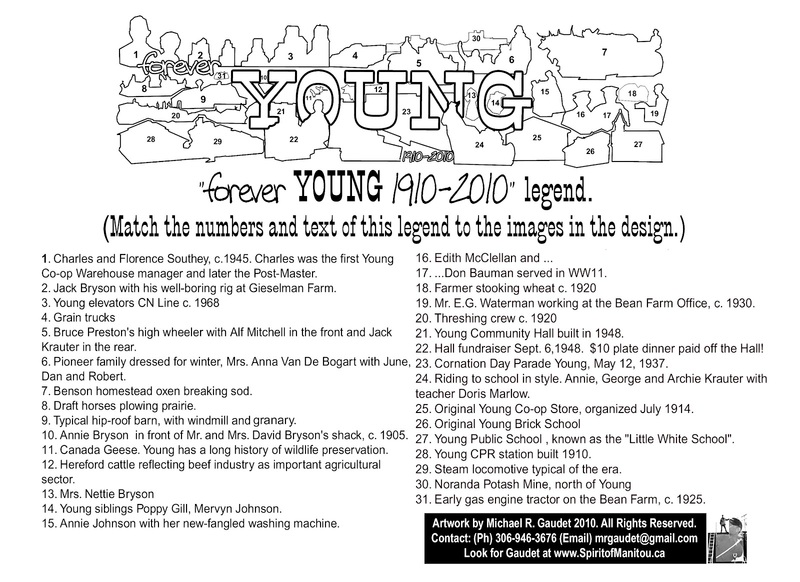 I presented my color mock-up of the 'forever Young' mural and it was very well-received. The transition from the monochrome version to the colorized is really quite remarkable. There's no question, the addition of full color makes a solid design that much more attractive. Yet again, I find myself pondering the meaning of life as I contemplate the logistics of this project. 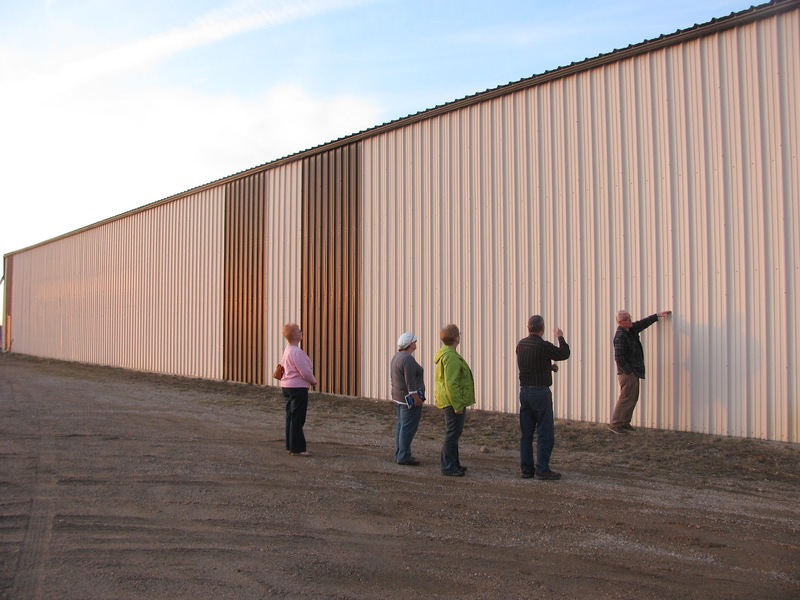 The mural will be painted on 4' x 8' panels that are specially designed and prepared for superior exterior durability. The project calls for about fifty-two of these panels so you can imagine that the sheer volume of material is quite staggering. Put it this way, I will not be handling these panels any more than absolutely necessary. However, they have to be separately primed (all sides and edges), man-handled into their respective position on to the temporary frame that I will be designing and building in the shop where all the excitement will take place. Scoping out the wall which will be the backdrop for the free-standing mural. Then comes the fun part: the painting! After the entire mural is painted on its temporary mount, it then has to be un-assembled to be permanently installed on its custom-designed free-standing painted steel frame. I believe that this mural will be the largest free-standing mural in Western Canada, if not Canada entirely. 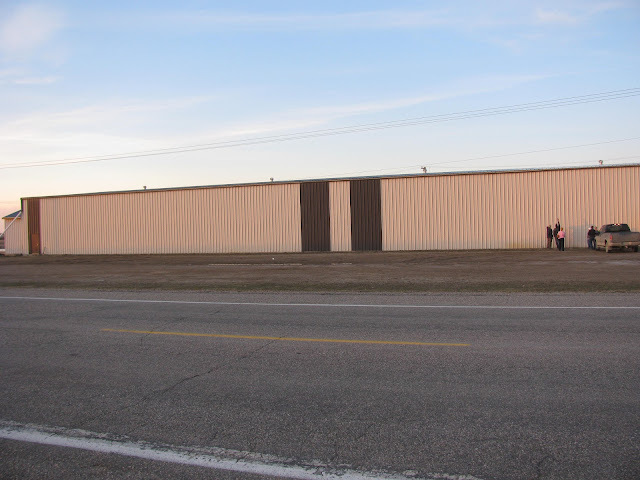 The setting of the mural from across the #2 highway. I will have to start researching this claim before I make it. We're talking about something perhaps two or three times larger than those huge highway billboards. About 1600 square feet, give or take. 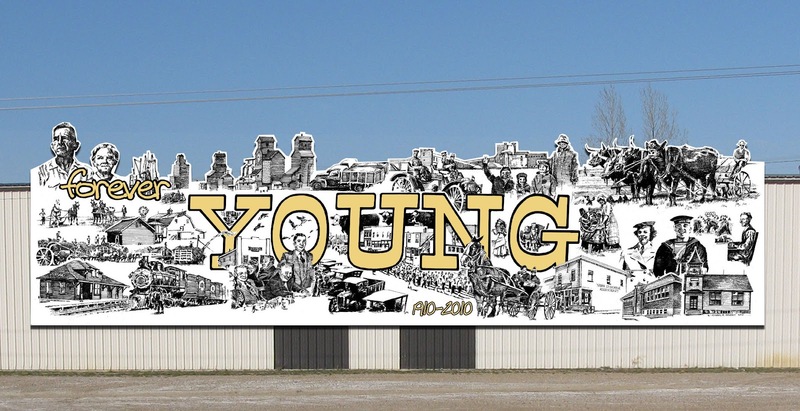 Mock-up showing position of free-standing mural in scale with the building. It will face the busy #2 highway. 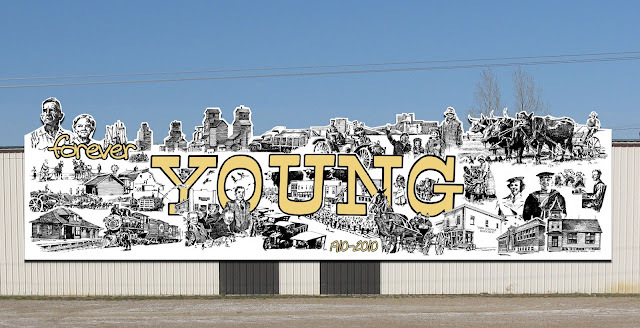 Have you ever heard of a huge free-standing mural? If you have seen one, heard of one or know of one that competes with the scale of this puppy, I would appreciate it if you would let me know. 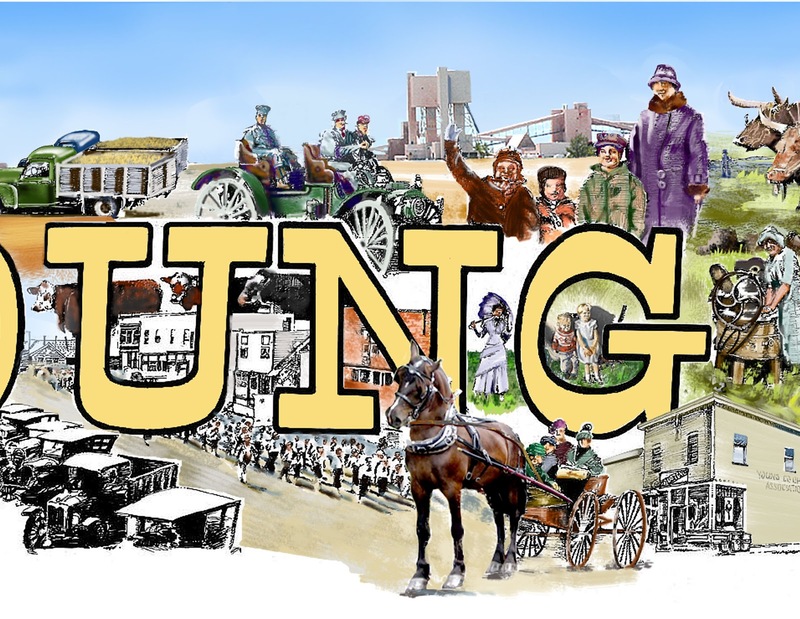 If you look carefully you'll see a tiny person standing by the lower right-hand corner of the free-standing mural. This ought to give you a pretty good idea of the scale of the is thing. I decided to post one more image that I CGI-ed to represent a life-sized human standing beside the free-standing mural in its location at Young. This will give a pretty clear indication of how ...big...this is. I spent the last few days slaving over a hot mouse to create a more or less full-color mock-up of the 'forever Young' mural in preparation for the next design conference...which is tonight. This is as important for me to see as it is no doubt for the committee. I worked out, for the first time, the overall color scheme and composition of the entire design from stem to stern. There is quite a bit going on with this 'montage-style' mural, as I found out in no uncertain terms while galavanting about in the design process. I say 'IN the design process' because I felt totally submerged in it for the past week. 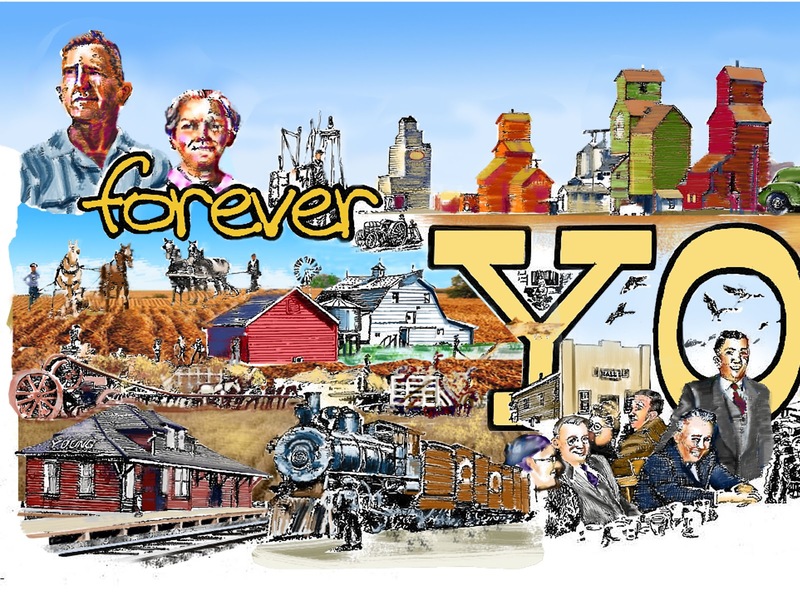 The 'forever Young' mural will measure a total of 84 running feet in length by about 20 feet in height. Please note: the 'skyline' of this mural will be actually cut-out so the entire section of 'sky-blue' that I have shown in this design is intended to represent the actual sky which will be visible above the mural 'in situ'. This added dimension will dramatically accentuate the three-dimensional effect of the figures on the horizon of the mural like a basic straight line could never do. I have gained a lot of experience from previous projects of this ilk so I know how much punch and pop this concept of a cut-out horizon delivers. It's tons more work but the outstanding results will make it all worthwhile. One of my favorite chunks torn out of the mock-up. Another Mega-Mural getting fired up! Q: When does a 'painting' become a 'Project'? 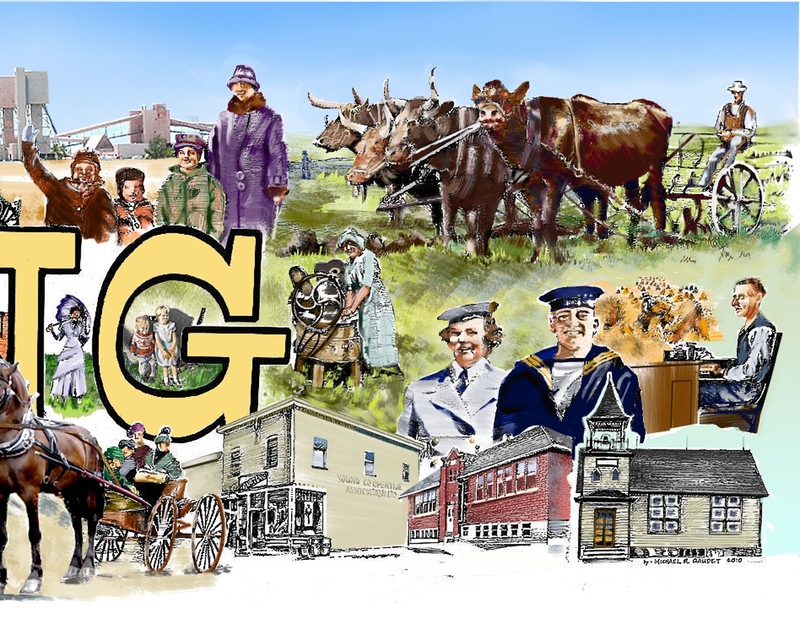 A: When it spans over 1280 square feet and chronicles the rich farm life and times of the vibrant community of Young, Saskatchewan! 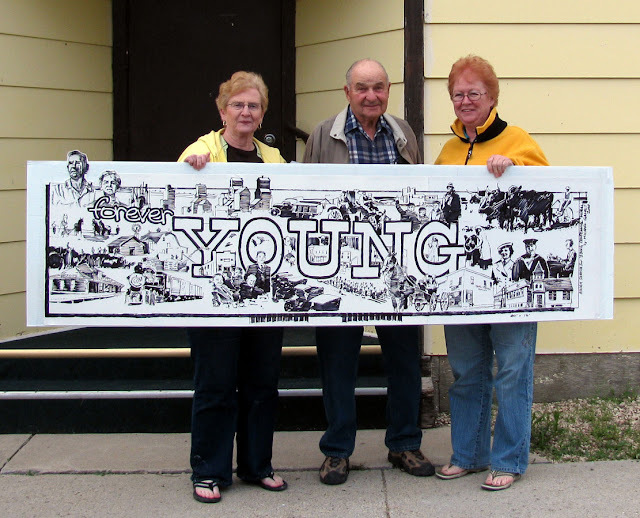 In 2010, the Village of Young, SK celebrated an important milestone in its history: it's 100th birthday! 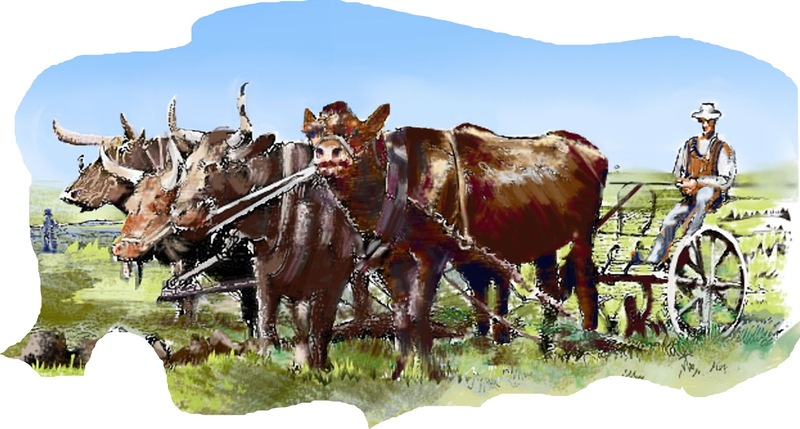 Not a community that lets things like this go unrecognized, the town marshaled its resources to host a huge homecoming party and also to commission commemorative artwork to celebrate the occasion. Three community members of Young who spear-headed the commemorative artwork project pose with the original approved artwork in its rough sketch form. Once the design was approved, it was my job to create a formal pen and ink rendering that could be used as the artwork to be reproduced in the form of a limited edition print which was offered for sale at the big homecoming as a fundraiser to generate the capital required to proceed with the mural project. One of the main organizers shown presenting a shrink-wrapped, archival-quality reproduction of the original artwork at the 100th Birthday Homecoming. The original pen & ink is hanging on the wall behind her. I participated in the unveiling of the original pen and ink drawing which ended up being over five feet in length. That's a pretty big pen and ink, especially considering the immense amount of intricate detail. The formats that were presented at the Homecoming included a 'bistro' style reproduction, which is printed on canvas and then stretched over a wooden frame for a ready-to-hang convenience. 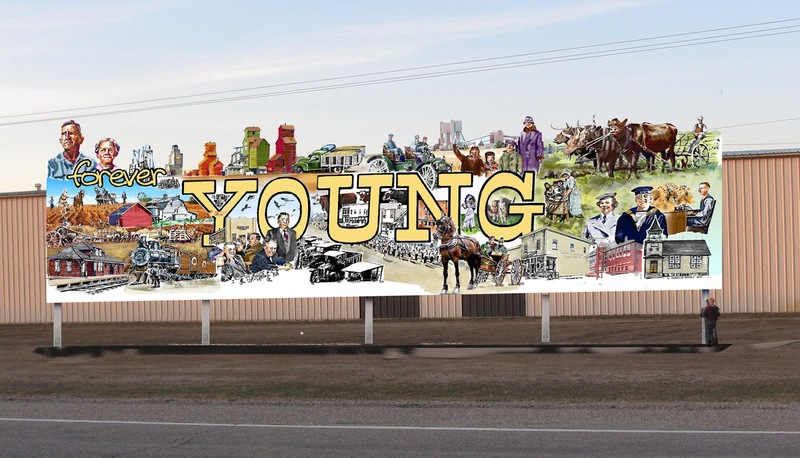 Once the artwork was approved and finished, I mocked up a rendering of the mural situated in position mounted on the wall of the Young Hockey Rink to show the scale of the finished piece. This early design is monochromatic. The actual mural will be painted in full-color, which will be an entirely different ball game! Computer-generated version of what the mural might look like on the wall. Last night I attended a meeting of the planning committee to work out some of the final details prior to starting to fabricate, construct, lay out and paint the mural. I cannot say enough about the good will and integrity of the committee members. They are a great group to work with and we are collectively enthusiastic and excited about the project. I will be filing regular progress reports over the coming weeks as this ambitious project proceeds. In about two or three weeks we will be setting up a mural-painting studio inside the hockey rink at Young where I will build a temporary wall on which to mount the panels in order to proceed. The projected completion date is early June. I have a LOT of painting to do between now and then which I am looking forward to diving into with my usual energy and enthusiasm. I created a 'legend' that corresponds with the design for identification of all of the elements in their historic context. Want to see more of my murals? Check this link. It was a good time and very interesting to make an appearance on the Shaw Cable TV show 'Lit Happens', hosted by well-known novelist Wes Funk. As the name 'Lit Happens' implies, this is a show dedicated to highlighting the literary talent of Saskatchewan and has included interviews with many best-selling authors since its inception. So it was a thrill when Wes invited me to go on the show as a 'blogger'. I was pleased that the producer spliced in several images of my art, commissions and our 'G-G's Gallery and Gifts' business. It was overall a great opportunity to share my art and art philosophy with the viewers. Without any further ado, here is the show. Sit back and enjoy the interview...it was a lot of fun!